Low-carbohydrate and ketogenic diets are taking the world by storm. These slimming plans promise quick results and fit today's busy lifestyle. A growing number of restaurants and stores are now offering low-sugar foods to keep up with the demand. Knowing what to eat on a high-protein, low-carb diet and planning your meals is the hardest part. From weight loss to improved mental focus and glycemic control, low-carb diets may seem like a cure-all. But what's true and what's not? Are these diet plans really worth the effort? According to a 2018 clinical trial published in The BMJ, cutting back on carbs may increase resting metabolic rate during weight-loss maintenance. Furthermore, it helps balance ghrelin and leptin, the hormones that regulate appetite. Dieters burned an extra 50 to 70 calories per day for every 10 percent reduction in carb intake. Researchers attribute these effects to the hormonal changes that occur in the body while on a low-carb diet. Diabetics could benefit from this approach too. A 2017 review featured in the Proceedings of the Nutrition Society suggests that low-carb diets may help in diabetes management by lowering postprandial blood sugar levels and improving blood lipids. Plus, they may reduce the need for diabetic medications and decrease the stress associated with this disease. There are thousands of low-carb, low-sugar foods available in stores, but this doesn't mean they're healthy and nutritious. Many of them contain hidden sugars, preservatives, synthetic flavors and potentially harmful chemicals. Luncheon meat, for example, has only 98.8 calories and 2.6 grams of carbs per ounce. But it also contains 81.2 grams of fat and provides little nutritional value. Its high sodium content shouldn't be overlooked, because it may lead to fluid retention and hypertension. As the Physicians Committee for Responsible Medicine notes, processed meat can significantly increase the risk of cancer, heart disease and premature death. Considering these facts, it makes sense to choose whole, natural foods and limit the consumption of processed foods, regardless of their sugar content. A high-protein, low-carb diet should work with your body, not against it. This way, you'll not only reach a healthy weight but also enjoy greater energy and get the nutrients needed to function at your peak. Let's take a look at some of the healthiest low-carb foods for a balanced diet. Except for liver, which stores glycogen and contains some carbs, most meats are carb-free. According to a 2015 review published in the journal Food & Nutrition Research, poultry and white meat, in general, may protect against diabetes, heart disease and obesity when consumed as part of a vegetable-rich diet. Researchers point out that poultry offers high-quality protein, vitamin E, vitamin K, vitamin B12, heme iron, zinc and other nutrients that promote optimal health. Fish is prized worldwide for its high content of protein and omega-3s. Salmon, tuna, mackerel and sardines are particularly beneficial. As the Harvard T.H. Chan School of Public Health notes, eating fatty fish once or twice a week can reduce heart disease risk by as much as 36 percent. The omega-3s in fish have been shown to improve blood lipids, fight inflammation and boost cardiovascular health. In 2018, the Journal of Internal Medicine published the results of a 16-year study assessing the link between fish consumption and mortality. Men who consumed fish regularly had a 37 percent lower risk of death from chronic liver disease, a 20 percent lower risk of death from respiratory disorders and a 6 percent lower risk of cancer mortality compared to those eating the least fish. The risk of death from heart disease was 10 percent lower in women who ate this food on a regular basis. Like meat, fish contains little or no carbs. Wild salmon, for example, has 153 calories, 21.6 grams of protein, 6.9 grams of fat and zero carbs per serving. Three ounces of mackerel provides 174 calories, 15.8 grams of protein and 11.8 grams of fat. One serving of halibut boasts 94 calories, 19 grams of protein and 1.4 grams of fat. Seafood is one of the healthiest and most delicious low-carb foods you can eat. From shrimp and crab to oysters, lobster and octopus, there are plenty of options available. These savory foods go well in salads, soups, stews and even casseroles. Have you ever tried oyster fricassee, shrimp tacos or lobster "alla diavola"? These dishes not only taste amazing but are low in carbs and calories. Cooked shrimp, for instance, boast 17.8 grams of protein, 0.9 gram of fat, zero carbs and 84.1 calories per serving. Lobster has only 135 calories and more than 28 grams of protein. The Shellfish Association of Great Britain states that oysters are 50 times higher in zinc compared to chicken. According to a 2018 review published in Physiological Sciences, this mineral plays a key role in energy metabolism, weight management and inflammatory processes. Zinc deficiency has been linked to a higher risk of obesity, Type 2 diabetes and metabolic disorders. Six medium oysters provide 509 percent of the RDA of zinc, making it easy to get this mineral in your diet. One serving of low-sodium mozzarella boasts 73 percent of the daily recommended intake of calcium. It also provides 280 calories, 28 grams of quality protein, 17 gram of fat and 3.1 grams of carbs. This Italian specialty is rich in selenium, phosphorus, zinc, vitamin B12 and riboflavin. Due to its high calcium content, mozzarella keeps your bones strong and protects against osteoporosis. A 2018 review published in Maturitas — The European Menopause Journal confirms that a low calcium intake may increase the risk of fractures. It also points out that too much calcium can be harmful and doesn't offer any additional benefits. According to researchers, calcium-rich foods are a better choice than dietary supplements. Calcium not only strengthens your bones, but may also prevent weight gain. A 2014 study published in The American Journal of Clinical Nutrition found that dietary calcium may reduce waist circumference in people who are genetically predisposed to excess abdominal fat. Even though it doesn't directly cause weight loss, it can speed up your progress — especially when consumed as part of a balanced diet. A large egg has only 0.4 gram of carbs and more than 6 grams of protein. It also contains 11 percent of the RDA of vitamin B12, 23 percent of the RDA of selenium, and 10 percent of the RDA of phosphorus. According to the latest research, the humble egg could help you get leaner and make healthy eating a lot easier. In 2017, the journal Nutrients published a study comparing the effects of eggs to the effects of oatmeal on appetite and cholesterol levels. Scientists have found that replacing oatmeal with eggs for breakfast doesn't affect blood lipids but increases satiety by reducing the hunger hormone ghrelin levels. Compared to oatmeal, eggs are higher in protein and fats and lower in carbs, keeping you full longer throughout the day. Furthermore, they're inexpensive and easy to prepare. Enjoy them scrambled, poached, boiled, sunny side up, or in salads and cooked meals. If you're on a low-carb, low-sugar diet, try the popular cloud bread. All you need are a few eggs, cream cheese, a pinch of salt and cream of tartar. Spinach, kale, mustard greens, bok choy, arugula, Swiss chard and watercress are all great choices for low-carb dieters. Dark, leafy greens boast large amounts of fiber and have few calories and carbs, filling you up quickly. Think about how you feel after eating a big salad versus a slice of cake or a bag of chips. Salad keeps you full longer and boosts your energy, while cake and chips cause blood sugar spikes followed by crashes. Take raw spinach, for example. One cup has only 6.9 calories and 1.1 grams of carbs but provides more than half the daily recommended intake of vitamin A and 181 percent of the RDA of vitamin K. It's also an excellent source of vitamin C, manganese, iron, magnesium and antioxidants. In a 2015 clinical trial published in the Journal of the American College of Nutrition, obese and overweight subjects who consumed spinach extract reported greater satiety and reduced hunger over a two-hour period compared to the placebo group. 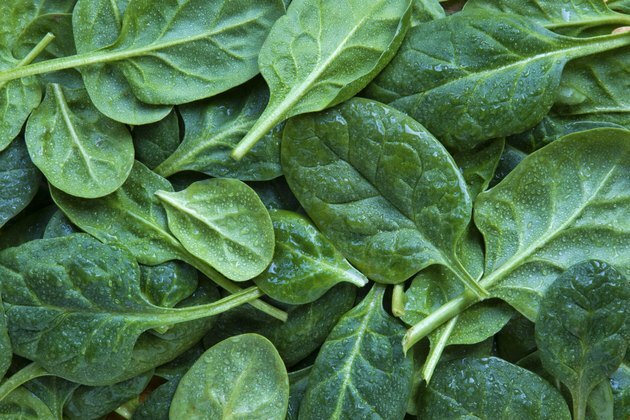 Researchers attribute these benefits to a class of compounds called thylakoids, which occur naturally in spinach leaves. These chemicals stimulate the production of satiety hormones and slow fat digestion while reducing ghrelin levels. Keep some low-carb fruit on hand to satisfy your sweet tooth. Avocados, blackberries, strawberries, raspberries, rhubarb, coconut, watermelon and grapefruit are just a few examples. These delicious low-sugar foods are filling and full of flavor — and you can enjoy them without guilt. One cup of strawberries, for instance, provides 48.9 calories, 1 gram of protein, 0.5 gram of fat and 11.7 grams of carbs, including 3 grams of fiber and 7.4 grams of sugars. Avocado is even lower in carbs. One cup has 240 calories, 3 grams of protein, 22 grams of fat and 12.8 grams of carbs, including 1 gram of sugar and 10.1 grams of fiber; if you subtract the fiber, you have 2.7 grams of net carbs. There are many other low-sugar foods you can include in your diet. Cruciferous veggies, coconut oil, olive oil, nuts and seeds, Greek yogurt and dark chocolate are just a few to mention. Snack on almonds or hard boiled eggs between meals, start your day with a high-protein breakfast and re-create your favorite recipes using low-carb ingredients like stevia, raw cocoa, flax meal or coconut flour. Harvard T.H. Chan School of Public Health: Fish: Friend or Foe? Are Canned Sardines Good for You? What Are the Benefits of Eating Smoked Oysters?